Pull in to the lot in front or back, self park and walk right in! We can accommodate both semi-private dining and private dining for groups of 10-100 people. Call 617-734-8400 for info. Aquitaine Bis brings Paris and one of Boston's favorite Bistros to the suburbs. Executive Chef Seth Woods' seasonal menu features all the favorites and traditions of Aquitaine - Bar à Vin Bistrot in the South End along with new items created specifically for the Newton location. We serve lunch and dinner daily including a popular brunch on both Saturday and Sunday. Best Restaurent in all of Newton. Easy winner. Brunch very special. Great music all 60s stuff. We love this place. A most enjoyable experience. The new design is lovely and the food and service were wonderful. The food & ambiance were great. Lovely decor since they redid it. 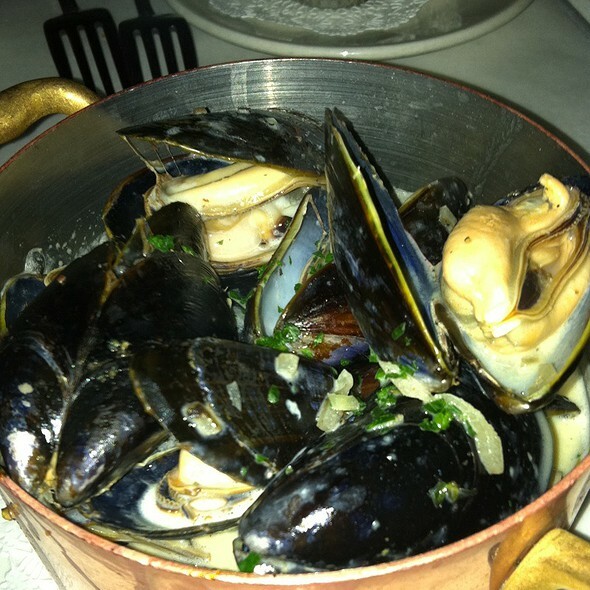 The food at Aqutaine Chestnut.Hill is consistently delicious! The menu offers a variety and the cocktails are excellent. Great place for brunch or dinner. The servers are attentive, friendly and efficient. Always very helpful. They know the menu. The bistro atmosphere is pleasant for dining and it has an upbeat atmosphere. Nice bar! The noise was not energetic, as the rating system suggested, it was unbearable. We were meeting with friends for dinner and could not have conversation at all because the music was so loud. Several times my friend asked to lower the sound with no success. We will not be back to this restaurant because of the noise level. Who said that having a loud music is good for the customers? It is definitive bad for your business. Went for my bff's birthday lunch. It was good but I prefer the dinner menu. Service was excellent! Love it here, always nice to see friendly faces. Ribeye special was out of this world as was our waiter. Definitely recommend, will be back soon. I love coming here for lunch. It’s a pretty place with a varied menu and the waiter is happy to accept special requests. It’s a little expensive for a vegetable sandwich but very enjoyable. We had a wonderful brunch. A shout out to our waiter Christopher. It is a definite go to place for any meal. I would recommend it for lunch but my experience with brunch was disappointing. Despite being among the first to be seated, my party of 6 had to wait about 15 minutes for someone to take our order (coffee and tea did come faster than that, however). When the food came ,it was lukewarm. My Swiss omelette was missing cheese. I would have said something but I wanted to spare my friends from the discomfort of eating while I waited for my food. There was only one slice of toast. It was excellent bread but one slice of toast? I know another friend at the table was disgruntled about that too. I’ve been coming here for years. 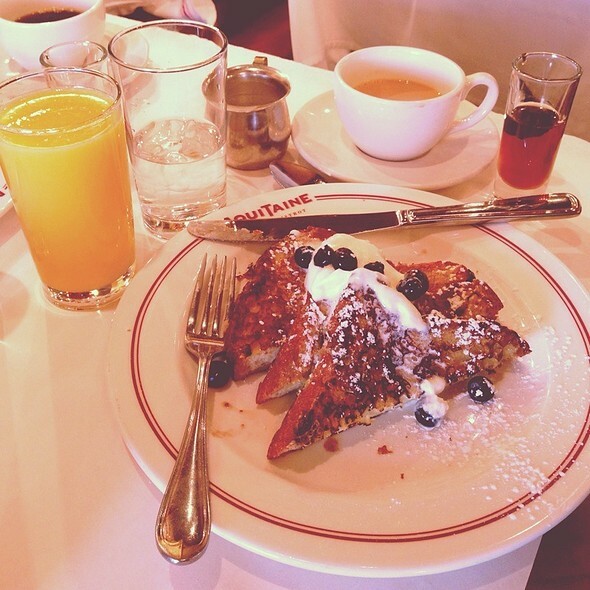 The breakfast is really good quality and value. What’s weird is that the staff is always so hit or miss. Our waiter felt bothered with asking for things like a plate to eat food on. The other thing that might sound picky, but they still haven’t changed is that they literally give you 5 small potatoes with your breakfast orders. These aren’t expensive items so it is perplexing. Fresh squeezed OJ is fantastic and great eggs Benedict. The service, again, was terrible. Long wait for both our starters as well as main courses. 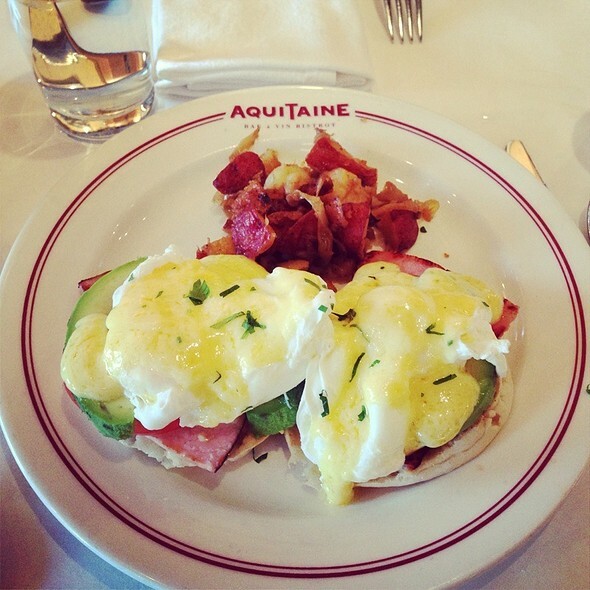 We have been to Aquitaine three times since it was reopened and on two occasions the service was bad. Maybe we are going there too much. Cocktails were good. Good menu but sandwich was smothered with sauce. Celebrated my sons birthday at Aquitaine, everybody loved it. Crunchy baguette and cheese puffs are complimentary, and a nice touch. Veal and scallops were delicious. Jess put a candle in our mousse, happy they paid attention to our reservation notes. 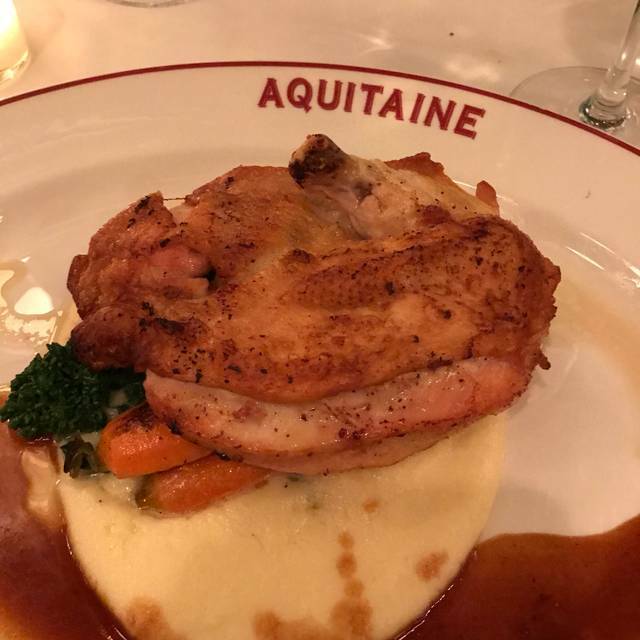 Had a great dinner at Aquitaine, it never fails. 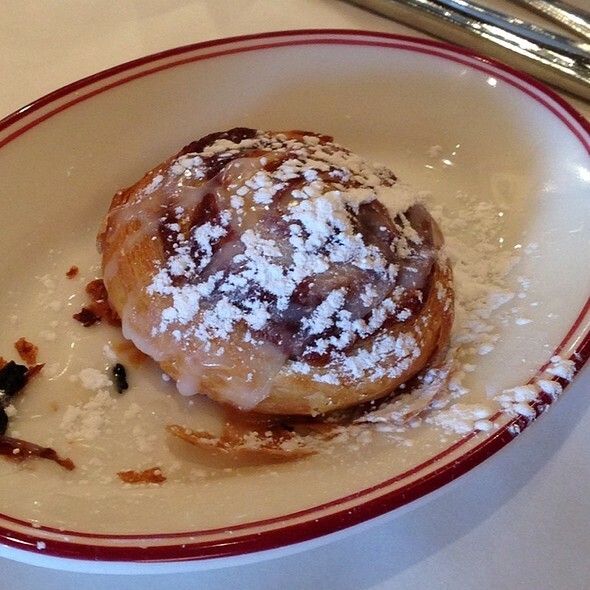 Our go-to is the french onion soup and we also enjoyed the beef bourguignon. The service was great and we will be back soon! We have only had great brunches and dinners. The hosts, servers, cuisine always meets and exceeds expectations. We had a lovely table for two at the window this past Saturday. Wonderful date night. A little bit of Paris in Dedham, MA. Thank you. They are back! Great food and service. The bar service is another highlight: secret to great meal is a great cocktail before the meal! We haven't been here for several years,and have been to the other Aquataines. The atmosphere was nice, and the soup and salads were excellent, but the main course (salmon) was skimpy, rather bland ,and overpriced. Our waitress was grumpy, and hard to find. Maybe they were understaffed. 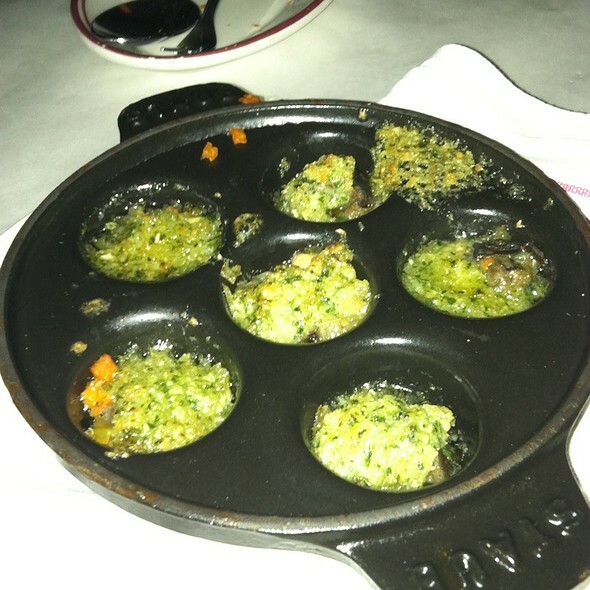 However, I love French food so we'll give it another try sometime. The food is delicious and the menu offers something for every palette. The servers are excellent, gracious, attentive and professional. The portions are substantial! The renovations made create a bistro atmosphere that is warm and upbeat. The cocktails are fantastic! Excellent spot for brunch on the weekend. Very nice selection of wines by the glass, a variety of egg dishes and a nice prix fixe option as well. Dined with friends and everyone's meals were excellent. Food is excellent. Great wine list with several French wines to choose from. Space is a little tight but not a problem. Given that I had made a reservation, I was disappointed that the table I was initially offered was not in a great location. The hostess responded pleasantly to my request for a different table, but it would have been great if that had not been necessary. We had a delightful lunch at Aquitaine Bis. 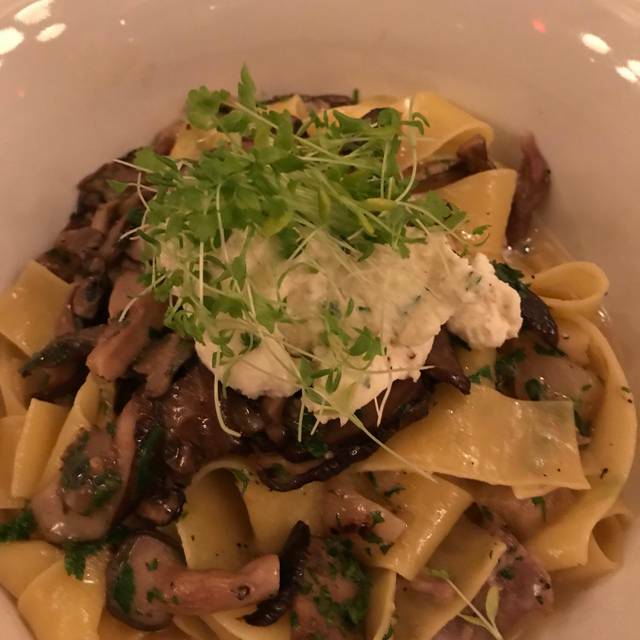 The food, the cozy yet elegant atmosphere, the service were all great. Excellent spot! Great Food and Service! Will be returning soon! The restaurant reopened about 3 or 4 months ago. It was always a go-to place for us; it is even better than it used to be. A renovated restaurant, new menu items and some chef specials along with a great staff make Aquitaine a French bistro with contemporary flair. And Eric, the bartender, handles the bar effortlessly with a friendly approach. Met two friends for lunch , 2 of us had the BLT Club sandwich..very good.! Attentive service, a nice spot at Chestnut Hill. I have been to this restaurant two times this week Since the food was really good . but yesterday when I had my Reddish , it tastes there is no washing process including. I can taste some sands on the surface of the veggies. The worst thing was the receptionist , she is not friendly and she did not arrange the waiting people in the ordinal position. I do not hope she has racial issuse. Just okay for the money.